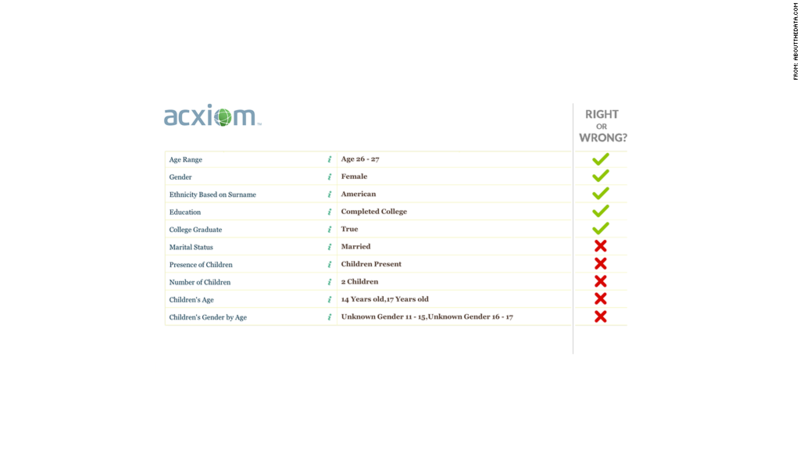 Acxiom's database got many things right about me, but many things were also wrong. Big Data has me all wrong: I'm evidently a 26-year-old mother of two teenagers, which is just about biologically impossible. And one of my female colleagues is a man who loves shopping for women's clothing. The info comes from Acxiom, one of the country's largest data brokers, which on Wednesday unveiled a website called AboutTheData.com. Punch in your name and a few key stats, and you can see a snapshot of the information sold to retailers and marketers so they can target you with things like catalogs and coupons. Acxiom claims to have a massive database that holds information on 190 million consumers -- everything from education level and political leanings to ethnicity and income level. When I checked my profile, I learned that Acxiom got some things right, such as my age (26), gender (female) and some interests (cooking and reading). But contrary to the report, I'm not married and don't have any children. The website, which is in beta mode, is a win for privacy advocates who have long called for increased transparency. But with that transparency comes a chance for us to see just how much information is gathered and sold -- and how much of it is off-base. "I knew they had a lot of information about me, but I didn't know they knew this much," said Pam Dixon, executive director of the World Privacy Forum. It also lets you see how much is actually right. In an informal survey of 10 people at CNNMoney, including myself, everyone reported at least one major inaccuracy in their profile. Most people reported multiple errors, and several people said many of the major personal, economic and other characteristics listed for them were wrong. A few people said their profiles were mostly on target. Household income and the highest level of education were off for most. Several people were incorrectly listed as parents like I was, while others had the wrong ethnicity based on their "surname." Interests were more likely to be on target, according to my informal survey, but these too were flawed. One city dweller, for example, was listed as an RV enthusiast, while my own profile incorrectly suggested I collect antiques. 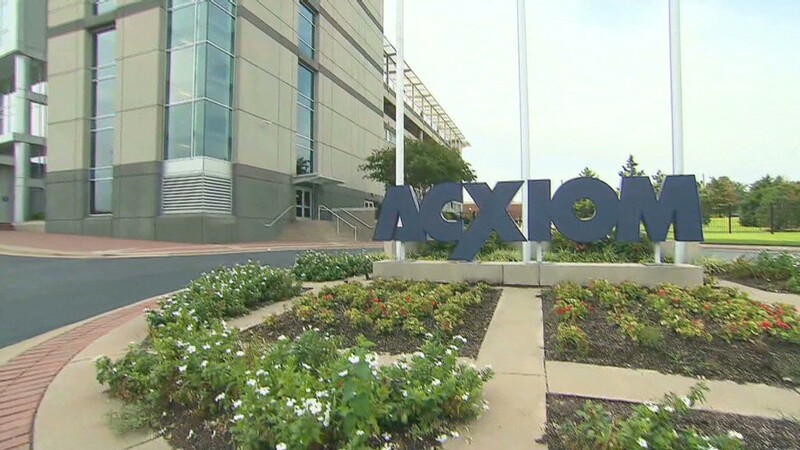 Acxiom said up to 30% of a person's profile information may be wrong at any given time since it is based on information from a variety of sources, including public records and surveys that may be incorrect or out of date. The company said the site shows its desire to be as transparent as possible. It even asks consumers to "correct" their profile in order to ensure they're receiving the most appropriate offers. If you are a 40-year-old man living in an affluent suburb with two young children, a marketer might try to entice you with offers for a luxury automobile with a high safety rating, Acxiom writes on its site. Your online shopping for camping equipment, meanwhile, might suggest that you are more interested in an SUV than a sports car. The site also allows you to "suppress" any of the information listed, which keeps it from being used for marketing purchases. Or you can "opt out" entirely, although opting out requires a much lengthier process. Privacy advocates say the inaccuracies are troublesome since there is still little transparency about which companies purchase the information and how exactly they use it. "It's gotten to the point where the big data machine is churning out profiles of consumers, which not only may or may not be accurate, but might be used for purposes that the individuals never imagined or consented to," said Susan Grant, director of consumer protection at the Consumer Federation of America, a watchdog group. Related: What type of consumer are you? Dixon, meanwhile, noticed that her characteristics changed drastically based on which email address she used to look up her profile. "One of these identities is not getting the same offers as the other identity," she said. "The concern is that the opportunities that you are being offered in life change based on how you are characterized."